Seeing as I am a sucker for anything with the word “wedding” in it, be it an excuse to smash cake in someone’s face, bake cookies or in this case, put meatballs in soup. Of course, traditional Italian Wedding Soup (also known as Minestra Maritata or Pignato Grasso) is said to have little to do with happily ever afters, but the marriage between meat and vegetables in a soup. 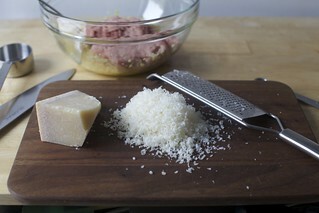 Associated with southern Italy, but more often parts of the Northeast, most recipes today have pork, a leafy green and some form of pasta in it, typically tiny ancini de pepe confetti. This soup is a quick riff on that, with turkey meatballs so good, I’d encourage you to make extra to serve with a future spaghetti dinner, escarole (though unable to find it, I used swiss chard), orzo and carrots in chicken stock. I’ve been pretty slackish about making dinner lately, but this was one of those things that go me over it, albeit briefly, as it could be done in a reasonable amount of time on a weekday evening. Or a snowy night, tucked in with a good movie and some dreamy chocolate pudding. 2018 Update: Over the years, this has become a winter staple, a kid-friendly (meatballs, pasta, cheese, nothing not to love) but also fairly quick (the meatballs are the only real work) meal for weeknights. Originally written for escarole as the greens, while it works here, more often than not we use baby spinach, kale or Swiss chard greens instead; I’ve updated the title to note this. If you’ve got time, of course, it’s even more amazing with a homemade chicken or parmesan broth (or, even better, a chicken broth cooked with a couple parmesan rinds) but the meatballs do most of the heavy lifting here. We always serve it with extra parmesan on top. In 2018, the soup got some much-needed fresh photos as well. It always occurs to me after the fact when I make this that if using a more tender green (baby spinach or chard), a few leaves could be well-chopped to replace the 2 tablespoons parsley in the meatballs, should you not already have parsley around. This make 4 main-course servings, although with kids, we find it feeds 6. Make meatballs: Whisk egg and 2 tablespoons water in medium bowl to blend. Mix in breadcrumbs; let stand one minute. 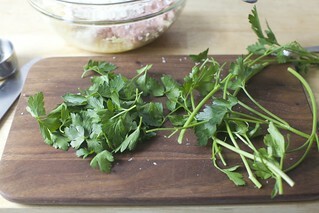 Add turkey, parmesan cheese, parsley, garlic, salt, and pepper; gently stir to blend. Using wet hands, shape turkey mixture into 1 1/4-inch-diameter meatballs. Place on baking sheet; chill while you prepare the next steps, or 30 minutes, if you have the time. 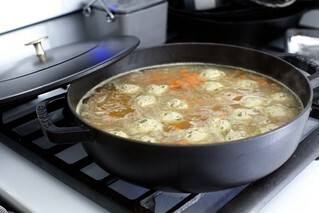 Assemble the soup:: Bring chicken broth to a boil in large (4 to 5-quart) pot. 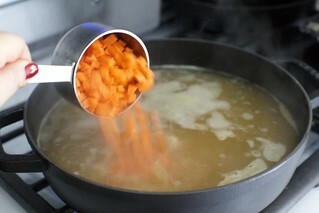 Add carrots and orzo; reduce heat to medium and simmer uncovered 8 minutes. Add turkey meatballs and simmer 10 minutes. Stir in chopped greens and simmer until turkey meatballs, orzo, and escarole are tender, about 5 minutes longer. Season soup to taste with salt and pepper. Ladle soup into bowls and serve. Do ahead: This be made 2 hours ahead. Rewarm over medium heat, thinning with more broth if needed or desired. Leftovers go over well in thermoses for lunch the next day. to it at the end of cooking just to heat through. If the leftovers are too thick…just add some more broth. I also make the meatballs out of ground chicken sometimes and those are really delicious as well. Oh, yummy. I make a chickpea escarole soup that always gets raves. I’ll definitely try this version. Oh, Deb, I love the fact that we got a little snow too… I was desperate to see it! You’re already making good use of your wide angle lens with those shots of the park. BTW, how do you get the pictobrowser to work on a wordpress blog? Or have you migrated away from wordpress by now? I can’t get the darn thing to show up on my blog and was just wondering. I’ll go back to swooning over your photos now…. This looks delicious, as do the photos. Everything is all gorgeous in white up here in Connecticut as well, but somehow, your photos still make me want to take the trip down to New York for a walk in the park. Or — even better — stay home and make this delicious soup. I’ve never cooked with escarole. Something I’d like to try! I do love orzo and the way it photographs is fun. That looks awesome! I especially love the winter photos, very pretty with the black and white. Lucky you for the snow, I miss it, and your photos are beautiful. We are getting to warm weather time here in Charleston, it is cold this weekend though. I will give your soup a try it looks delicous. My dad cooks with escarole alot, I am sure he will like this also. I am insanely jealous of the snow. Rarely do we get more than a spattering, at best. When we were in New York a couple of weeks ago, there was some snow and I was embarrassingly excited. Not that anything accumulated, but just seeing actual snow was enough for this Southern girl. I am so ready to pack up and move north! I love the pictures of the snow. I so miss it! We must work near each other. I went out to Madison Sq Park to take photos also! I work on the fourth story (tall for New Haven) of a modern building. 15 feel of glass per story, and my desk is right next to the windows, facing outward. I feel like I’m in a snowglobe. I love it! I’m glad the snow came early because it was such fun to wake up to it – but I might feel differently if I had to commute to work. Was it actually snowing when you took these photos? I’m scared to take my camera out with the snow, but I really want to get some shots of this. (It’s still snowing fairly heavily in CT). We switched to ground turkey for meatballs a while back (exactly your recipe above, plus crushed red pepper and more garlic…always more garlic). I find we get a little grossed out at the toughness and overpowering meatiness of other ground meats now… Anyway, a couple weeks ago we had only 6oz or so of ground turkey and wanted spaghetti and meatballs. There were these button mushrooms that were just sort of hanging out in the fridge, so I minced up 4 or 5 and threw them in, and it was a definite success. If you ever find the plain-turkey meatball mix too light in flavor, the minced mushrooms give it an earthiness that’s really satisfying. Also, gorgeous pictures! They make tolerating our weeks and weeks of snow (upper midwest) almost seem possible. oh my god Snow was my first book! I don’t believe it’s a Dr. Seuss book though, it’s P.D. Eastman. “Snow snow snow. Look at the snow.” I grew up in Buffalo, it was very fitting. The soup looks wonderful. your pictures of NYC look gorgeous. I wish I could wander through a winter wonderland like that, minus the frigid temperatures and getneral wetness. This looks absolutely delicious, and has made me hungry for… a second lunch, since I don’t have any of your soup on hand. Beautiful snow pictures- come to Colorado if you want more of that ;-). Alissa — I think it’s that recipe of the day feature on Epicurious, getting us all on the same cooking schedule. I actually liked that it thickened a little, but I like thicker soups! Linda â€“ I love the beans idea; had seen it in the comments on Epicurious but then forgot to add them. Next time. jennbec â€“ I use the WordPress publishing platform but on my own server/host, so maybe I can do things that the hosted WordPress doesn’t allow? I had always assumed they were the same, but I guess not. Rachael â€“ Yes, it was snowing and I was terrified of getting the camera too wet, which is why the shots are kind of rushed and snapshot-y. I only had the wide angle on, and wanted to switch to the macro/50 mm to get closer shots of details but was too worried to get the camera interior wet. And I hadn’t brought a towel, because I was worried I’d be carrying too much and would lose my balance with 7 pounds of camera equipment on me. In short: I was a bundle of anxiety. Typical. sara â€“ That is so great! Tell me, were you disappointed that you couldn’t make perfectly round snow balls like they had in the pictures? Btw, if anyone is confused as to why my friend Jocelyn has been sporadically leaving Beastie Boys lyrics in the comments lately, it’s because she’s SO EXCITED that we’re seeing them in a few weeks. As am I. But my favorite lyric of theirs can’t be reprinted. Alas. Oh, I love those pictures, particularly the first and third one. It all looks so beautifully romantic and other-worldly. A few weeks? Try ONE week and FOUR days. Yum, I would totally make this AND love it. I get what you mean about fresh snow; there really is nothing else like it. The pureness, the cleanliness and the quiet that it brings- we Minnesotans get that a lot, and this year has been a good one. Your pictures look like the past few months here. And that book? TOTALLY one of my favs! I loved the dog in it. thanks for clearing up the Jocelyn thing. Loved the NYC pics. I always wondered if it really looks like the movie “You’ve Got Mail”, and your pics do indeed look like those street scenes. I must visit sometime. I read “Of course, this isnâ€™t a story about how cute I was when I was four (though the correct answer is â€œveryâ€)…” and, seeing it was a link, clicked it thinking ~ Oh goody a baby picture! *Well* you were quite an adorable little pot carrots my dear. Oh thanks for posting this! 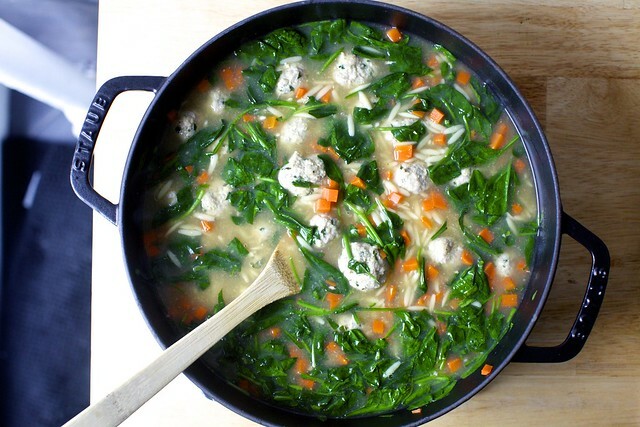 I love wedding soup, but have never made it myself. I’m also trying to eat healthy as many days out of the week I can, so I love the idea of turkey meatballs. Very nice. This soup looks delicious. As to your lack of snow, I’m jealous. In Iowa, we haven’t seen our driveways since November! The neighbors had the roof to their covered porch collapse under the weight… and we lost cable (omg no interwebs dying agh) for almost a week. We haven’t had a winter like this in… uh, ever. Love the photo of grating the cheese! I had a similar thing happen as a child. I had a book read to me so frequently that I memorized it, my parents thinking I was a brilliant child prodigy, reading at age three, until they figured out I just knew what words went with the pictures. Now, onto the soup. Is it in bad taste for me to say you had me at meatballs? Because those meatballs – don’t gag – look good raw. And meat and Parmesan cheese combined together, well, I’m sorry, I’m just stuck on the meatballs. Lovely winter pictures of beautiful Manhattan — and an equally comforting meal. Love your blog! Looks good! Are the meatballs easy to break into smaller bites with a spoon? For another tasty wedding-related soup, see here and here (two variations on the same Turkish red lentil “bride” soup). Yes. I still think you’re cute …. sometimes…. We make this soup frequently during the winter, I don’t use carrots, but it’s a great idea. 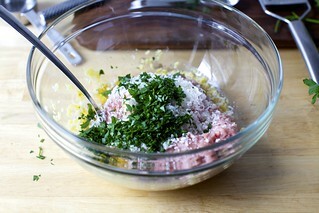 I add about 1/2 tsp of grated lemon rind to meatball mix – it’s a wonderful sunny addition! Still snowing in Boston! What beautiful pictures of nyc in the snow! We’ve had snow on & off here lately, but since we have to drive to get anywhere, it’s not nearly as romantic! The photos are so beautiful! I will second (or third) that they are very romantic. I am also jealous about the Beastie Boys! This is a version of my family’s favorite soup. The recipe came from my aunt’s italian Grandmother-in-law. It always graces any holiday dinner table. We’ve always just called it escarole soup, though some years when escarole couldn’t be found it was made with spinach. And we use cubed mozzerella cheese instead of parmesan and bow tie pasta instead of orzo or ancini de pepe. And, we add in the chicken meat that was boiled to make the broth as well. The combo of the chicken and the meatballs makes it very hearty and fulfilling. I’m so glad to see this soup here. Most people have never even heard of escarole or this delicious soup made from it. Oops, I should pay better attention. We use parmesan cheese in the meatballs, for sure. But the cubed mozzerella is for dropping into the soup right before you eat it. It melts and gets a little stringy and makes a nice gooey, creamy addition to the rest of the soup. Also, you should cook the meatballs until browned before putting them in the soup. This can be done in the oven or in a skillet and can easily be done ahead of time and kept in the fridge. You get a much better texture and flavor that way and you cook off some of the fat that will make the top of the soup filmy. Sorry, I’ve totally geeked out on seeing this soup here. It’s one of my ultimate favorite dishes. Yum! This is one of my favorite soups – even though I detest chicken noodle (egg noodles – bleh). Do you think adding other greens would detract? 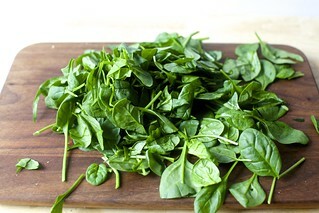 I’m on a spinach kick like no tomorrow. Those photographs are stunning! Honestly, they are gorgeous. I’m so jealous, not only of your talent, but of your snow! The soup is wonderful too. I make this often, as did my mom, as did her mom. It has always been a staple in our family. I make my little meatballs with a mixture of veal and turkey. I also add cannellini beans sometimes, and I use acini di pepe pastina. It holds its shape a little better when you reheat the soup the next day. This is a great comforting soup to celebrate the snow! Your BW photographs are beautiful and show a New York winterland that I have never seen before. These should be printed larger , framed and hung on the wall. I’d buy one! Thanks for the pics of Manhattan, b+w is a nice touch. You could sell those shots, yes. Thanks, too for your great work on the blog. From the Great White North. I admit it. I resent snow, purely because I hate winter. I even kind of resent the fact that your photos are so beautiful, because I find myself beginning to appreciate the snow and have to remind myself: ‘COLD, AARGH’. But… your photos are beautiful, haha. It’s enough to make me want to pack up and move to wherever it snows. I don’t really care where exactly…just somewhere that I can see snow like THAT. How did you know I have been itching to make Italian Wedding soup? I haven’t had it in YEARS, and I think my husband would actually like it (he is kind of picky about soup). But how? You love bitter things and last I checked, swiss chard isn’t. In a large stock pot or Dutch oven, sautee the soffrito in a bit of olive oil. Reduce the heat and add the garlic, Italian seasoning and remaining spices, sautee just until fragrant—do not brown. Add the chicken stock and about 3 cups of water. Bring to a boil. splash of milk– approx. 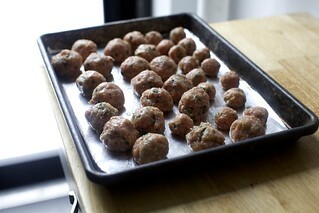 1/4 c.
Form into nickel-sized meatballs by rolling in your palm and drop into the barely simmering broth. Add the kale to the broth. Stir gently. 2 more med. carrots cut thick on the diagonal. Simmer uncovered for at least an hour. Serve over hot cooked pasta. Only you could make winter so beautiful looking! I’m doing backflips that it’s freakin’ finally warming up around here, but your shots actually make me long for a little bit more cold. That first fountain shot is heartbreakingly lovely. Thanks for a great blog!! Hilarious. I did that too with another Doctor Seuss Book: One Fish Two Fish. The book “Snow” was one of my favorites, too! Growing up in the NY suburbs, we would take fresh snow, put it in a pan and drizzle maple syrup on it. Mmmm. Now, I have to travel to the snow and my kids don’t get to have the experience of waking up to everything in white. Another favorite book was “Stone Soup”, which goes along with this post, too. We make that all the time, with whatever we have in the fridge/pantry, but generally without the stones. I love your blog! I did the same thing when I was younger- only I did it because I really hated reading so I would pretend I was! im actually rather pleased that I wasn’t around for the snow this past weekend…looked pretty chilly! congrats on the shout-out in the current issue of Real Simple! i just saw it earlier on line at the market! Ahhh – deliciousness. I was in a soup mood yesterday – made this and a lovely lentil with sausage – my family inhaled both. Of course we live in the armpit of Missouri, so couldn’t find kale OR escarole, so ended up with spinach. Still tasty and delicious, if not quite according to the recipe. Thanks! ps. you are one of the only people to make me miss the snow in nyc. but only miss. I’m going to stay right here with the fruit blossoms exploding and rhubarb on the way! I adore IWS. I like the meatballs cooked ahead of time, though, and added back in at the end. The carrot seems like a really great addition; I love the mix of green and orange, and carrot is a natural with chicken broth. I will try this for sure! Gorgeous photos, just breath taking! I love this soup and have been making it for several years now. It does turn into stoup the next day as the orzo soaks up most of the broth, but that’s no problem flavor-wise. Hey Deb! I have been wanting to make this soup for awhile and finally have a lot of the ingredients in my fridge with plans to make this for dinner tonight. =) I do have a quick question in regards to an ingredient substitution and wanted your opinion. I got some beautiful baby spinach from the farmer’s market this weekend and was wondering if I could use it in place of the escarole. Will it hold up as well in the soup? Or should I just stop on the way home and pick up some escarole? Hi Carolynne — I think you could definitely use spinach, but put it in only in the last minute or two; it cooks very quickly. Enjoy! Hi Deb, i just wanted to say that i just recently came across your site totally by random. And by my total surprise i became instantly addicted. I have made a few of your recipes and my husband and i are always really happy with the meal or occasional treat in the end. Well, now we are adding this one to our list of favorites. Thank you. I made this tonight (my first ever attempt at soup — I was afraid). This is so accessible, tasty, and hearty. thanks so much! Made it tonight. Delicious. Thanks! I made this soup tonight, and it was absolutely delish! Next time I think I will start with more broth, though. The orzo really soaked it up. Also, I sauteed leaks and added them when I added the carrots. I think they left a really great flavor. Can’t wait to have the leftovers tomorrow! Thanks so much for sharing this recipe. made this last night to bring to a couple who just miscarried. i saved some for myself and it was excellent – comforting and delicious. perfect for the occasion, especially after this blizzard. The wedding soup that I grew up on didn’t contain pasta but rather an egg/cheese mixture stirred into the soup at the end. Yours looks considerably healthier (and delicious!). We just finished off this soup and were very disappointed with the meatballs. They just tasted too funky, off. I can’t quite describe it. Fresh turkey, too. We are going to try it with fish meatballs this weekend instead. Other than that it’s a great little soup. Comfort. Hi Deb! I am new to your blog (i love love love it!) and I tried this out this weekend, delish! I loved it! And also you take the most beautiful photos! this is also delicious with ground chicken (due to personal aversion to turkey). I didn’t understand why the carrots needed to cook so long and added them just before the escarole. thank you for this great recipe, as always. This was great! I had wanted to try this soup for a while and I’m glad I did. Since there was no escarole to be seen, I used swiss chard in its place. All worked out well. What could I substitute for the parm…. I’ve never really heard of a parmesan substitute (well, pecorino romano is often suggestion but if dairy is this issue, that’s not help). However, you can skip it. LOVE your website! Could I bake these turkey meatballs (similar to your chicken meatballs recipe), if I want them as an appetizer instead of in the soup? Hi Nour — No reason why not. It sounded as if many reviewers on Epicurious had done that, too. So I started to make this but discovered we had no orzo midway through cooking. Whoops. Anyway, a wild rice medley from TJ’s filled in nicely. I also added some white beans. Loved it! It is freakin cold outside and the husband and I wanted soup. This was soooo good! Thank you! I now have a belly full of soupy, noodly, leafy, meatbally goodness. Made this last night and the whole family devoured it. The extra sprinkling of parmesan on top is a must! This is great. Whole foods did not have escarole so used chard. This soup was delicious! I used homemade chicken stock and baked the meatballs first, and hubs gobbled it up. Will def add to our soup rotations…thx! I made a variant of this soup with kamut which I had leftover cooked in the fridge and savoy cabbage, with a few leftover pinto beans also. it was good! I just made this soup, with barley instead of orzo. It is divine! I made enough to stock up in my freezer, and am looking forward to getting through the winter months with it. Marcia — What a great idea. I love the idea of putting a heartier grain in it — thank you. AMAZING! We simmered parmesan rinds for about 30 minutes before adding the carrots and orzo. The result was fantastic– it really complemented the flavor of the meatballs. This is one of my favorite go to recipes on a chilly night. The only thing I add is a little fresh lemon zest in the meatballs, and I lightly sautee the escarole in virgin olive oil, garlic and crushed red pepper (a little freshly grated nutmeg..yum) before adding the rest of the ingredients. The crushed red pepper really warms you up from the inside out and as an American/Italian I find a way to add fresh garlic to most of my dishes! I have never tried escarole. How does it taste? Yes, and those stories for them are funny while for me is pretty embarrassing most of the time that when it happens, I can’t help but just walk away for a while and cool of a bit. I just made this today with my 3 year old son! How simple! Perfect way to spend a day in awaiting the arival of Hurricane Sandy. LOVE your blog. Stay safe! The soup looks good and filling with the meat beals. I wonder if it will still look and taste good if I substitute the meat with fish instead? Anybody tried this with fish or maybe prawns? I’m making this for the second time tonight – it really is delicious! I can’t find ground turkey (mince here) so have used chicken (mince/ground), and spinach instead of escarole which I don’t think I’ve ever seen either :) A bit of extra garlic in the soup, it is light, warming, and the meatballs are so tender and yummy. It is definitely on my dinners list now. Made this tonight and it was delicious!! Will 100% make again. Super easy and flavorful– A+ I used chicory– is it the same thing? I think everyone has a great substitute. Too bad we don’t have escarole so I’ll just substitute lentils. The turkey meat is a refreshing twist instead of using the typical pork meatball. It’s more healthy and cost efficient esp after Thanksgiving or Christmas. The parmesan is a great idea too. Yum, I would totally make this AND love it. thanks for posting this!! I’m 5 years late, and it isn’t exactly the season but I found escarole at my local farmer’s market and that sealed the deal. Well well, the pics had me hooked and it was surprinsingly eeeeaaassssyyyyyy to make. Had no orzo so I substituted with Quinoa. IT IS A KEEPER!!! I linked here from your new chicken stock recipe, which I used to make this soup. Really delicious! Wegman’s sells bags of cut escarole and this was super easy to pull together. If you have time to make the meatballs and cut the carrot ahead of time, this is a very quick dinner. Just made this and am in fact enjoying it now – brilliant recipe! Didn’t find the escarole so I swapped with spinach, and luckily I caught your comment about adding spinach at the very last minute because it cooks quickly. The “weight” of the turkey meatballs is perfection and while I wasn’t sure if the broth would be tasty, it totally took on the flavor of the meatballs and parmesan. Perfect winter weeknight supper, thank you! About how many meatballs will this make? Yikes, I never counted. I’d expect it to be at least 2 dozen, though, if tiny. DEB. Oh, Deb. I’ve just made this soup for the first time, and it is fantastic. Dare I say, the best soup there ever was. I even made mine with vegan “Chik’n” broth and gluten free orzo (I’m not really that pretentious, I swear – just trying some new things out) and it is truly amazing. THANK YOU for the best blog (and cookbooks) a girl could ask for. You make my weekend kitchen conquests utterly delightful! I made this tonight coincidentally – very similar to yours but the recipe i had called for a half cup of grated parmesan mixed with a lightly beaten egg that you whisk into the soup at the end…..SOOOOO good. Love SK – your recipes are my go to! I thought to myself, there’s no way a soup this simple can be anything to write home about. But I had a ton of escarole from my CSA to use up so I made a double batch. My husband and I can’t stop talking about it! I was skeptical that the turkey meatballs would be bland and get tough from cooking in the broth but they’re soft, pillowy, and packed with flavor. The soup is even better the next day when it’s had time to sit and marry for a while. I’m so happy we have the whole second batch in the freezer!! Thanks for another winner, Deb. I really like this soup. Been making it for years. 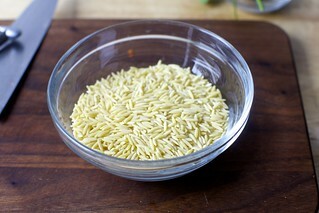 After it sits overnight or a day or so the orzo keeps expanding and become very mushy. Do you have any suggestion to mitigate this? Thanks for all the inspiration. Mary Jo — As with chicken noodle soup, I know many people prefer to keep the noodles separate from the soup, just rewarm them together before serving. Simple but delicious! Hubs loved it (he’s a soup guy) AND my toddler gobbled it up (had seconds!). Win all around. Subbed kale for the escarole and it worked wonderfully. Definitely going to be one of my future go-to soups! This was great and a nice light dinner. I threw a leftover Parmesan rind in the broth while it was boiling and subbed kale for escarole because that’s what I could find. Just missing a nice baguette for dipping! Love this recipe! I made it with turkey meatballs and faro instead of orzo, and spinach instead of escarole, because that’s what I had or could buy in a hurry. My family asked for it again, and tonight I am making it with swiss chard and ground chicken meatballs. I made this, following all directions – but substituted turkey for beef (only because that’s what I had in the refrigerator). Absolutely delicious! Hi Deb!! 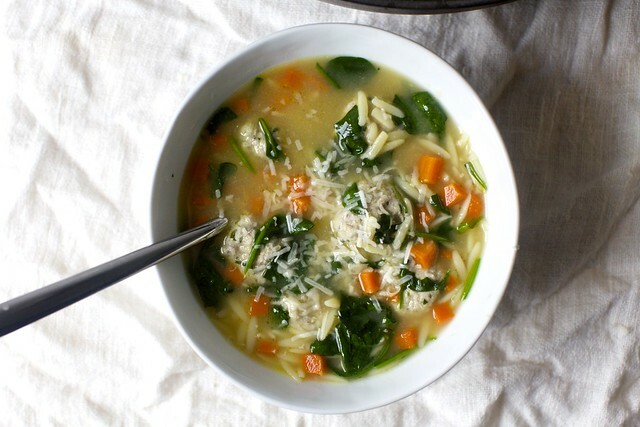 Is there anything you could substitute for the parmesan to make this a dairy free soup? Sarah, I made it tonight using a vegan “parmesan” recipe, and honestly, it didn’t taste any different than my regular meatballs! It added an additional savory element, but you can recreate it with a bit more salt and garlic, I think. I’ve never used cheese in my meatballs b/c of Kosher, and I wanted to see what I was missing…but I think it’s a-ok to just skip. I’ve heard this too! I have many meatball recipes without cheese (a new one today even, although skip the spices for this soup, unless you want them here, in which case, actually that sounds delicious) and you could use one of them instead. My husband made this for dinner last night and it was ridiculously good and fairly easy to make. Everyone loved it–especially my toddler whose favorite food group is definitely meatballs. It’s a fairly light, but very warming for a cold winter’s night. We served it with garlic bread on the side and it made for a great dinner. We used homemade turkey stock and baby spinach as the greens in the soup. We also used dried parsley in the meatballs, which worked totally fine. Absolutely fab. Cannot believe how delicious the meatballs turned out & how easy they were to assemble. In the future I am going to double the meatball recipe so I can freeze some! Hi! I’m making this now (so excited for it!) but can’t for the life of me figure out the temp and cooking time for the meatballs. Perhaps it got axed with the update? I’m so silly you boil them in the soup! The Braille brand orzo I bought says it should be cooked for 9 min for al dente, but the recipe has it cooking for 23 min. Something isn’t adding up here. You can put it in later if you’re worried about it getting too soft. Any thoughts on the timing of the cooking if I made the meatballs in advance and froze them to use as-needed? I think they’d only need 3 to 4 minutes more, tops, to cook through. I make them really tiny so they cook fast. I threw them in halfway through the initial carrot cook time and it worked great. Cooking the meatballs from the freezer in the soup makes this a screaming-toddler, crying-baby, exhausted-momma combo approved recipe. Thank you! do i bake the meatballs before adding to the broth???? Nope! They cook fully in the soup. I just wanted to ask you if the meatballs can be made without adding cheese. Alternatively, what can I subsitute for cheese? I definitely think that the cheese can be skipped. I know some people like to add some nutritional yeast to recipes instead of cheese, but haven’t tested it here. I made this for us this evening after seeing a photo on your instagram feed a couple of days ago. It just looked so pretty that I had to make it. Mine came out just as pretty and it was scrumptious. We’re calling it our new chicken noodle soup. I did use ground chicken instead of ground turkey. And our choice of greens was rainbow swiss chard. Thanks for this wonderful, flavorful, and fast soup! I just finished making this and didn’t have really high hopes. I had never used turkey meatballs in a soup. I added the Parmesan rinds and must tell you this soup is to die for! My Jewish grandmothers would be proud. Thanks for all your amazing recipes! So delicious!